Textured Transluscent Plastic is a very curious material. With a light behind it, the material seems to glow as a smoky monsoon of diffuse radiance. A laser through it will diffract into chaos, but a laser through two layered sheets will instead spread into constellations. But how to build a lamp of it? Originally, I wanted to see if I could get the lamp to float, perhaps held aloft in a fan, or somehow using magnets. Ultimately, the imperfections in construction made these plans impossible; a fan will not hold it up much better than it would hold up a cheesecloth. That said, the construction is hours away from a semi-permanent home above my bed. Last week, we spoke to Glen Liberman from Kinekt Design (http://www.kinektdesign.com). 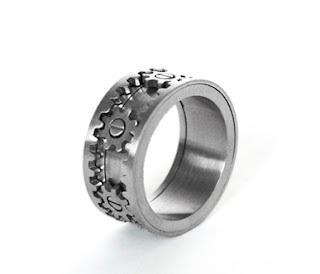 Glen launched his company with the patented Gear Ring, which features six micro-precision gears that turn in unison when the outer rims are spun. The Gear Ring currently has over 1 million views on YouTube (http://www.youtube.com/watch?v=NI2N6fsPjjg). One of his most recent design objects, inspired by Toshio Iwai’s Electroplankton game, is a square object designed to convey a sound wave. For fabrication, Glen intends to make each limited edition object out of glass and create a “new kind of snow globe” by filling the object with water and tiny plastic “square wave” fish.